Jumeirah Beach is located in the city of Dubai, United Arab Emirates. It is a relaxing white sand beach that stretches along the coastal area of the historic district of the city. The Jumeirah Beach Residence is next to the Dubai Marina district, as well as the port amenities at Jebel Ali. 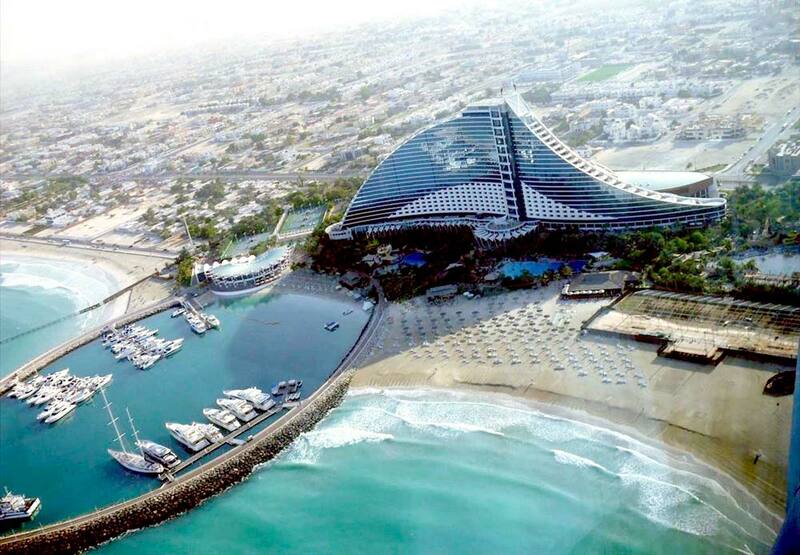 The beach frontage area has many large resorts, hotels, parks, and housing developments, which include the Burj Al Arab Hotel, Jumeirah Beach Hotel, Wild Wadi Water Park, the Madinat Jumeirah, a old-style hotel and shopping complex. The Jumeira Beach has a peaceful water front and the views are stunning. There are public areas at Jumeira Beach but they do not have any facilities. The other beaches are for hotel guests; although, people can buy tickets at the hotels to use the private beaches. There are quite a few beach rules, and it is important to follow them because there are many police that patrol the area to enforce them. These clean beaches have restrooms, a kid’s park, plenty of restaurants, bars and other activities. The ocean water is light green and there are not many shells or rocks that will bother visitors. However, the fine white sand on the beach can get very hot almost any day of the year. Many visitors enjoy snorkeling and swimming here. This five-start resort hotel has a unique wave-like design and is one of the city’s most instantly recognizable structures. The hotel has over six hundred villas, suites, and rooms that are luxuriously furnished along with offering beautiful views of the beach and the Arabian Gulf. The resort has five swimming pools, a scuba diving center, The Hub for teenagers, Sinbad’s Kids Club and unlimited admittance to the famous Wild Wadi Water Park. Additionally, there are nighttime tennis courts, and three squash courts along with a steam bath.